It’s a fun day here at Nancy Zieman Productions! We’re excited to be part of The Vintage Home Sewing Book Blog Hop hosted by our friend Bev McCullough over at Flamingo Toes. Bev’s NEW! Vintage Home Sewing book from Nancy’s Notions features a colorful collection of eight vintage-inspired projects to sew for your home. 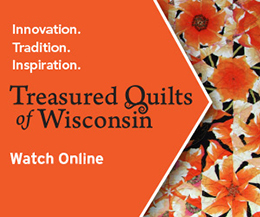 View all eight vintage-inspired projects from the NEW! Vintage Home Sewing book over at the Nancy’s Notions web site! All eight projects are beautifully laid out in this soft-cover 44 page book. Bev’s Colorful Dresden Floor Pillows, on page 17, especially caught Team NZP’s attention! These sweet Dresden floor pillows look complicated, but they are quick and easy to make with Bev’s easy directions. Nancy Zieman’s Trace ’n Create Dresden Template from Clover is the perfect tool for this project. Plus the step by step photography in the NEW! Vintage Home Sewing book from Nancy’s Notions is beautiful! BONUS! All the projects are sewn and shown in the book in two colorways! One set is made in Bev’s bright red/pink/aqua fabric collection, Vintage Adventure from Riley Blake Fabrics. The second set of projects are sewn in a more muted/farmhouse style fabric collection. It’s fun to see Bev’s eight vintage-inspired projects take on new looks in the NEW! Vintage Home Sewing book from Nancy’s Notions. Team NZP is enjoying Bev’s beautiful book of sewing projects. We know you’ll enjoy it, too. 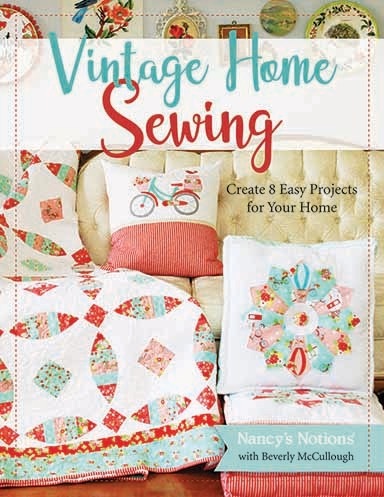 Thank you Bev for including The Nancy Zieman Blog in The Vintage Home Sewing Book Blog Hop! For a chance to win a copy of the NEW! Vintage Home Sewing book from Nancy’s Notions please view Bev’s project photos over at the Nancy’s Notions site, then leave a comment below sharing which of the eight vintage-inspired projects you’d sew for your home, or for a gift! I love anything Dresden,so the pillows and the Hexies. This would make a great bedroom makeover for my bedroom starting with the quilt, followed with pillows. Hand towels for the bathroomand a framed Dresden wall hanging. Include coasters for that nightly glass of water. I would be all set for a new spring bedroom!! I love the bike. It reminds me of a bike I had growing up. I like the quilt and the bicycle pillow. First off, I love the theme and colors!!! My favorite projects would be the zipper pouch, coasters, bicycle pillow, and the quilt! Dresden Floor Pillow is my favorite but like several others also. The fabric used brings a bright Spring season. All of these patterns are so delightful, but I especially love the Bicycle pillow. These vintage projects make me think of when life was so much simpler. I just miss Nancy. Great book. I love the fresh clean colors used for the projects. The bicycle would be the first project. Not sure it would be on a pillow, but I will have to put it somewhere. I’d start with the dresden floor pillows. Beautiful design. I love dresdens of all sorts so the pillows would be my first make, but the whole idea of this book takes me back to a kinder, gentler time and I love it! I’d make the Diamond and Ring quilt. I would have to make my girlfriends the bicycle pillow. I love all the collection, I would love to win the book so I can make them !! I really LOVE the Dresden designs! I’ve been wanting to learn to make some. This would be great to have since it has the instructions! I love the Dresden Plate floor pillows. I would make these for my grandchildren to sit on. Thanks for ipportunity if the chance to win this book! I like the Bicycle pillow and the tote bags also look cute!!! Our craft group does a gift exchange during the winter holiday season. The first tote I would make would be a gift. The next totes would be for me. One can never have too many totes. I would incorporate the dresden plate on some and definitely apply a zipper pocket in each. the bicycle pillow – definitely! I love the Diamond and Ring quilt, it Iooks so playful! The Dresden floor pillows if I had to pick just one favorite! I like the pillows and the bags, but it is really difficult to pick a project or two when they are all so neat and creative. I really like the Dresden pillow. I think I’d start with those adorable hexie coasters and the Daisy Bouquet Dishtowel, followed by the quilted box and Dresden floor pillow! Thank you for keeping Nancy’s spirit alive in these posts. Lots of great Ideas. Guess I would try them all. I like the daisy bouquet tea towel. I just love the Dresden plate pillows! So pretty! I love the vintage look! I would make the pillows. My son just purchased a new couch and the pillows would be nice. I’d make all 8 of the projects, but I’d probably make the floor pillow first. So many lovely projects! I would make the quilted zipper box filled with sewing supplies for a friend and the Dresden pillows for my sewing room. I would make the Dresden pillow. Love the fabric line. Love the Look! I would like the bicycle pillow, and the tote bags would be cute and useful! I would make the bicycle pillow to display on my patio chair! Brings back memories of riding my bike in childhood! I think the zippered box looks like a fun place to start. I love the colors and fabrics on all these projects! The Dresden Floor Cushion, so pretty! The appliqued block could be used for quilt squares and wall art too. Definitely a lovely “gifty” idea! I would make the tote 1st. No doubt! I’d definitely make the dresden floor pillows! I would make the pillows. So pretty. Such beautiful projects in this book! My favorite is the Dresden floor pillows, although this is the type of book in which I would make one of every project. Perfect looking for a Alabama farmhouse! I’d love to start with the pincushion. Thank you! Pillows! You can’t have too many pillows. The colors in the diamonds and rings quilt warmed my heart immediately. I’d make the quilt first. The tote bags were interesting also. How unfair of you to make me choose just one! The zippered box bag for me, please. I love the book How much is it? I like the quilted box zipper bag. The quilted designs give a lovely vintage look. I would sew the Dresden Pillow for my home. I have some of my Grandma’s vintage hankies I’d like to add in there as well. I think I would make the tote. We never seem to have enough and these are pretty enough for gifts. I would make the pillows. New ones are needed in my family room. I am addicted to Hexi’s and would start with some new coasters for our living room. I just made my first Dresden plate pattern and would like to make the pillow.The quilted box zipper bag would be a great gift for a friend of mine. I would start with a bang by doing the quilt. I love the color combo of red and turquoise. The Adventure Awaits Embroidery Hoop is one project I would definitely make. I would most likely use a different trim, but one just as colorful as the photo shows. The embroidered bicycle pillow really calls my name. All the projects look great. I would start with the simple hexie coasters. I would start with the floor pillow and then move to the scrappy quit! Love the colors chosen. I would make the pillows first. What a nice collection of projects. I could never have too many totes. That would be my first project from this book. The dresden floor pillows would be awesome, and the quilted zipper box would come in sew handy! I’d also like to try my hand at the tote, and quilt, too! What a beautiful book! Each of the projects would be so fun to make and I absolutely love the fabric that was used. I would love to make the totes or floor pillow to start, then of course make all the projects! I would like to make them all. They are so very cute and useful to our home or as gifts. I would make the scrappy quilt first. I would make the dresden pillows. This is a very pretty book – just to have it sitting out as a display. But the contents of how to make the items is even better. I would like to make the zipper pouch and all the items would make great gifts for grads, newlyweds, birthdays, etc. I hope i can win this book. Thank you kindly. I would sew the hexi coasters and the quilt. Please check with Nancy’s Notions regarding the availability of the book: 1-800-833-0690. Thank you. LOVE the Dresden pillows .. perfect for my bedroom !! Love these colors and fabrics used. I want to make them ALL! Would love to make the coasters and dishtowels. The quilt would be nice too, if I could find the time. I’d make the quilt for sure. New pillows for my living room are also on my list. Would love to make the pin cushion for my sewing room. These are adorable just love the colors. The sweet Daisy Bouquet dish towel would be a great gift. I love the “world” applique framed in an embroidery hoop with the “Adventure Awaits” words. Clever, cute, and oh so perfect for my world traveler daughter! I would make the bag. I like the Diamond Quilt and the Quilted Box. PS. I am also named Bev, and have been on a “quest” to find a Bev under the age of 50 or 60. Does the author apply? I need something to brighten up my living room and to prepare my mind for Spring. It gets kind of dreary in the northland. I would love to make some pillows and the quilt in both the farmhouse and the vintage type prints! I love the towels what a cute idea! This would be an awesome book to own. Hope I win! I would make the coasters and the bag. Do not have room to make the quilt, have to stick with smaller projects. Pillows! New sofa pillows of bright colors and fabrics would brighten up these dreary winter days. I would make the quilt. Love the simplicity of the pattern and that material is so pretty and cute, but I think it would be pretty in any colors. The scrappy strip quilt really caught my eye. That would be my first project but the Dresden plate pillow would not be far behind. I truly love the vintage fabric line from Riley Blake. I love this! I would love to make the floor pillow! Also, I love the retro fabric. I would love to make the Dresden floor pillow but in a darker color palette so it would not show dirt as easily. OH! WOW!! what a great looking book-sure would love to add it to my library. I love Dresden plate pattern so think I would first make the pillow but also like the tote bag. Hard to choose which one to do first, but leaning towards the pillows. I would love to make the bags and the bicycle pillow. The book looks great and I love the fabrics! I also LOVE the Vintage fabric line from Riley Blake designs. I would make the Dresden pillow for sure. It’s so hard to pick a project that I would pick two of the projects, the embroidered bicycle pillow and the vintage embrodery tote. Love to bike so would love to make this pillow for myself. Everyone can use a tote and this one is so charming that I would make one for my daughter and my daughters-in-law. I would sew a bag for my daughter! I really like the bags. They are so bright and cheerful.